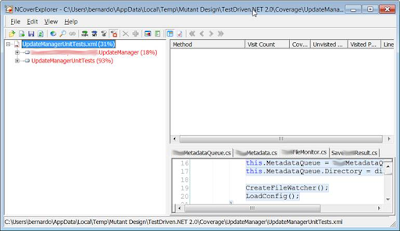 What is unit test code coverage benchmarking/analysis? Unit test code coverage analysis essentially tells us "how much of my codebase is covered (or "exercised") by my unit test suite?" When we are writing unit tests, it is necessary to visually scan the codebase and get a feel for what degree of coverage we have and what parts of the codebase are important/relevant for unit test. Setting up a benchmark such as "a standard .NET codebase must have at least 70% unit test coverage" can be useful, as although this is not a fail-safe way to make sure that we are testing the right things, we can at least be certain that if our metrics indicate we meet the benchmark, most of the important stuff will be tested. There are several tools available that will provide this sort of metric on a .NET codebase - including NDepend, NCover, etc. 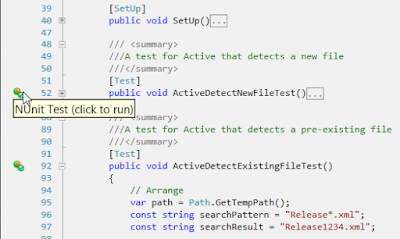 TestDriven.NET is a tool that is primary intended to support unit test development, but it has a lot of overlap with ReSharper. 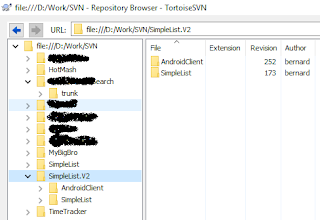 If you're already using ReSharper currently (as many .NET development teams do) - and given the fact that ReSharper generally has superior functionality where there is functionality overlap with TestDriven.NET - there is not a lot of value for us in having an additional tool for this purpose. System.ArgumentException: Empty path name is not legal. 19 passed, 0 failed, 0 skipped, took 10.13 seconds (NUnit 2.6.1). 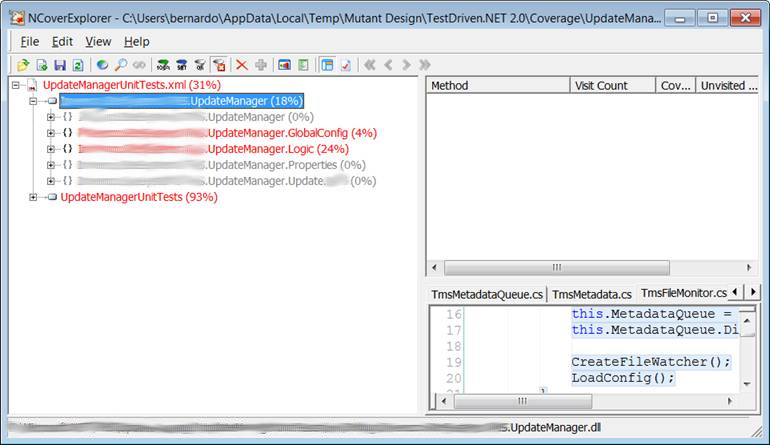 Using NCoverExplorer, you can browse the codebase (by namespace) under test that has been analysed by NCover and establish the percentage that each assembly, namespace, class and event method/property is covered by unit test. Setting and adhering to a code coverage benchmark (and tooling up accordingly) is a step along the way to establishing a mature, modern software development practice. Adopting unit testing as a practice by itself is extremely important. However, code coverage benchmarking and analysis provides the on-going measurement and reporting that is required to be able to sustain the practice. 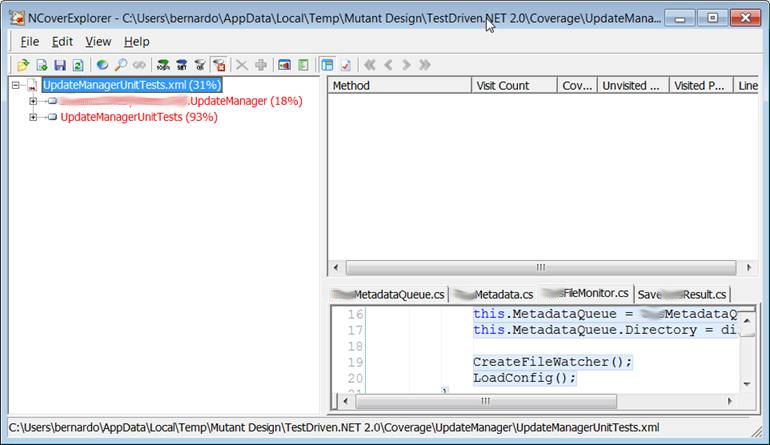 TestDriven.NET and NCover provide a way to get started with adopting and learning this practice relatively cheaply. TestDriven.NET is free for personal use. When TestDriven.NET is installed over the top of ReSharper, it can sometimes "replace" some of ReSharper's very nice unit testing automation functions (such as those neat little green dots on the left side of the text editor that will launch a test for you and indicate the most recent result). 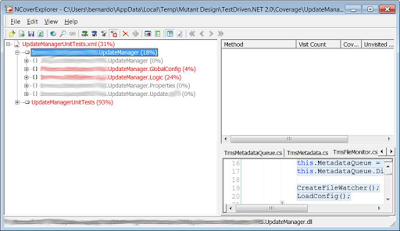 Never fear - in order to get ReSharper's functionality back, just re-install ReSharper back over the top of TestDriven.NET. It's a bit of a "sledge hammer" approach, but you only need to do it once, and it works.